Coming Soon: New Harvard Square Branch! 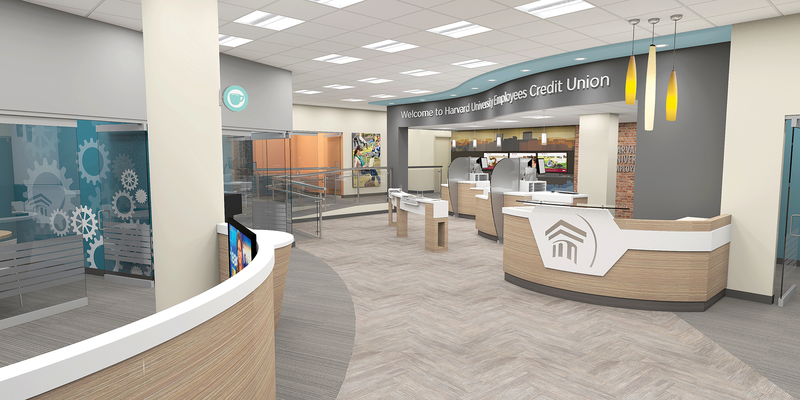 Just two short blocks down the road from the existing branch, the upper floors of this new location currently house the Credit Union’s operations and support offices. We’ve listened to your feedback and many of your considerations will be reflected in the new design. The expanded space will allow us to provide new features as well as added convenience to our members. To accommodate deeper financial conversations and collaboration, members can expect better privacy and ample conference room space. In addition, we will have a designated area where HUECU technology will be demonstrated and taught. HUECU first opened its doors on June 26, 1939, on the top floor of Lehman Hall. Over time, the Credit Union expanded its office space to include other locations on the University campus, as well as the Holyoke Center (now the Smith Campus Center) before moving to the current Dunster St. location in 2006. Development plans are under way for the new location and an early rendering can be seen here. We look forward to showing you our new office space this summer − where we will continue to offer you the best in member services that you have come to expect from HUECU!